Since I have no idea on which of this controler to pick, which one do you recommend if I want the best of your design? My needs is the one that can be used with universal remote, display and four inputs? Since you have the r/2r kit, how much is the complete kit including shipping to U.S ? Where can I find the details of r/2r? But if you do not like the fade and discrete mechanical sound of relay (this do not propagate to speakers ! ) this is not for you ! In path of audio signal there are only at max attenuation 6resitors and have the most transparent sound of a passive preamplifier . output is on -gnd on output is enabled. What is price for kit with that functions? Yes all of your idea are possible and already implemented in one of my tube amplifier ! On LCD it will appear : " Warming up tube !" U anodic is off and mute is on , and after 60 seconds it will say " Ready !" in this time mute will stay active and only after U anodic is connected the mute relay will be released . If you do not want to use a LCD please tell and I will provide schematics for led only on front panel . An atmel AVR programmed with firmware will cost you without transport 5 euro . Last edited by danzup; 26th November 2009 at 09:23 AM. Thanks for answer .I send you private mail for buy controler. Firmware for this project (the .bin and .hex files ready for programming the atmega16) . Last edited by danzup; 2nd December 2009 at 01:58 PM. I soldered volume control with M8515 & PGA2310. I used 2xATtiny2313 and changed source code for both. One of ATtiny2313 uses for amplifire switching on/off and basscontrol. Other ATtiny2313 uses only for treble control. It turns on when amplifire is on. And Pryanick : I like those MLT resistors , give so sweet sound ! 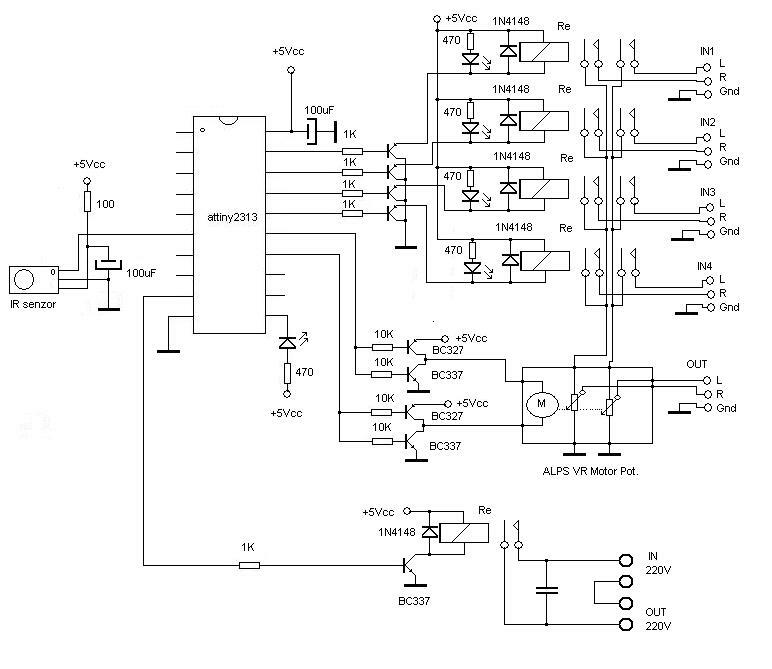 I will post some time soft and schematics with one atmega16 with r/2r 6 relay for volume and 7 relay for bass and 7 relay for treble controller (exactly like your but extended for 7 relay each tone control : bass and treble for 0dB in the middle and -5dB, -10dB ,-15dB and +5dB , +10dB , +15dB on both ). Last edited by danzup; 3rd December 2009 at 10:59 AM.